A cabinet card of four of the Anderson children. 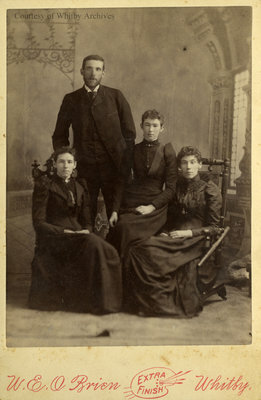 In this photograph: Amelia Ann Anderson, Isabella Jessie Anderson, unidentified Anderson male, and unidentified Anderson female. George (1821-1910) and Isabella (Tocher) (1830-1920) Anderson had eight children: George Tocher (1856-1939), Jane Booth (1857-1866), Isabella Jessie (1859-1943), William Booth (1861-1900), Alexander J. (1864-1888), Amelia Ann (1867-19016), Marshall (1869-1887) and Mary E. (1871-1892). Anderson Family Portrait, c.1886, W.E. O'Brien. Whitby Archives A2013_047_001. Scanned from a cabinet card.